Inherited epidermolysis bullosa (EB) is a group of skin diseases characterized by blistering of the skin and mucous membranes. There are four major types of EB (EB simplex, junctional EB, dystrophic EB and Kindler syndrome) caused by different gene mutations. Dystrophic EB is derived from mutations in the type VII collagen gene (COL7A1), encoding a protein which is the predominant component of the anchoring fibrils at the dermal-epidermal junction. For the first time in literature, we have evaluated the presence of anti-skin autoantibodies in a wider cohort of patients suffering from inherited EB and ascertained whether they may be a marker of disease activity. 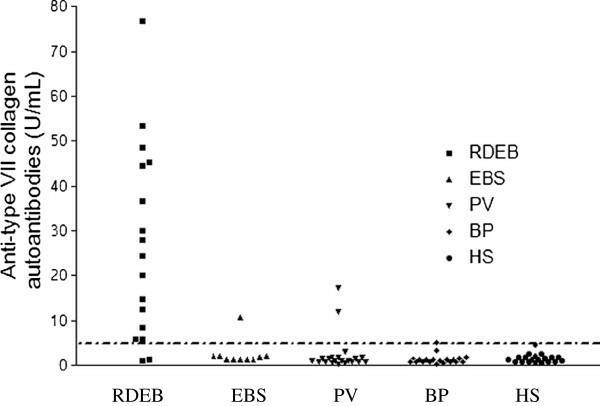 Sera from patients with inherited EB, 17 with recessive dystrophic EB (RDEB), 10 with EB simplex (EBS) were analysed. As much as 20 patients with pemphigus vulgaris, 21 patients with bullous pemphigoid and 20 healthy subjects were used as controls. Anti-skin autoantibodies were tested in all samples with the Indirect Immunofluorescence (IIF) method and the currently available ELISA method in order to detect anti-type VII collagen, anti-BP180 and anti-BP230 autoantibodies. The mean concentrations of anti-type VII collagen autoantibodies titres, anti-BP180 and anti-BP230 autoantibodies were statistically higher in RDEB patients than in EBS patients. The sensitivity and specificity of the anti-type VII collagen ELISA test were 88.2% and 96.7%. 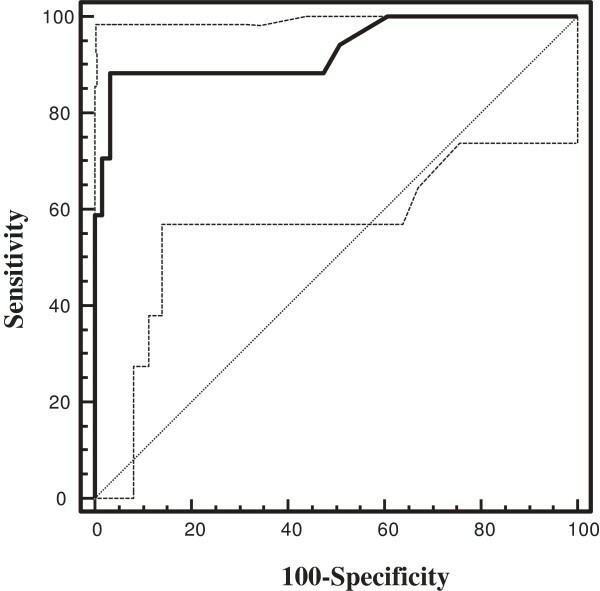 The Birmingham Epidermolysis Bullosa Severity score, which is used to evaluate the severity of the disease, correlated with anti-skin autoantibodies titres. The precise pathogenic role of circulating anti-skin autoantibodies in RDEB is unclear. There is a higher prevalence of both anti-type VII collagen and other autoantibodies in patients with RDEB, but their presence can be interpreted as an epiphenomenon. Inherited EB is now known to result from more than 1100 mutations, encompassing more than 14 distinct structural genes expressed within the cutaneous basement membrane zone (BMZ) at the dermoepidermal junction [5, 6]. After the initial clinical evaluation, based on careful examination of cutaneous and extracutaneous manifestations and inheritance pattern, the diagnosis is confirmed by the use of three main techniques: immunofluorescence mapping (IFM), transmission electron microscopy (TEM), which can both be used to identify the level of skin cleavage, and mutation analysis . TEM is considered the gold standard laboratory test for differentiation between the various forms of EB. The primary advantage is that it can visualize ultra-structural abnormalities and may be particularly useful in patients with mild DEB or EBS. However, TEM is time-consuming and expensive, and the results are, to a high degree, operator-dependent and sometimes inaccurate . The diagnostic precision of IFM is similar to that of TEM, with the advantage that it is simpler and faster both to perform and to interpret. A previous study has shown that IFM is more sensitive (97% vs. 71%) and specific (100% vs. 81%) than TEM . The type VII collagen, the main constituent of the anchoring fibrils, is composed of a triple-helical domain flanked by a large 145 kDa non-collagenous amino-terminal (NC-1) domain and a small 34 kDa non-collagenous carboxyl-terminal (NC-2) domain [11, 12]. In patients with DEB, ultrastructural analysis of skin demonstrates the presence of altered anchoring fibrils, reduced in number or completely absent in the different forms . In addition to inherited forms of EB, there is an acquired form of epidermolysis bullosa (EBA), which is caused by an auto-reactive response against collagen VII. Patients with EBA have both tissue-bound and circulating IgG autoantibodies against type VII collagen [14, 15]. Specifically, circulating autoantibodies recognize epitopes within the amino-terminal NC-1 domain of type VII collagen [16, 17]; only a small number of EBA patients have been described with autoantibodies reactivity against the NC-2 domain . The routine screening tests for the diagnosis of EBA are: direct and indirect immunofluorescence microscopy; in particular, the salt-split skin method. Patients with EBA have immune deposits on the dermal side of salt-split skin, whereas in bullous pemphigoid (BP) deposits are on the epidermal side. However, this method does not distinguish EBA from anti-laminin 332 mucous membrane pemphigoid (MMP) or anti-laminin c1 pemphigoid as these diseases also show immune deposition on the dermal side of salt-split skin. EBA sera recognize the 290 kDa type VII collagen protein in immunoblotting studies; in fact, this reactivity confirms the diagnosis of EBA. However, immunoblotting studies are difficult to carry out because they are time-consuming and technically demanding. Advances in the identification of target antigens and the subsequent development of an increasing number of sensitive and specific assays for the detection of circulating autoantibodies, including recombinant forms of the target antigens and ELISA, allow serological diagnosis in patients with autoimmune skin disorders. Several ELISA systems using recombinant fragments of BP180, BP230, desmoglein1, desmoglein3, have become commercially available and are highly valuable diagnostic tools . ELISAs were also developed to detect autoantibodies in EBA using different recombinant proteins of the NC-1 domain of type VII collagen [20, 21]. Previous reports demonstrate that these tests showed high sensitivity and specificity, and in some clinical studies serial titres of anti-type collagen VII from each patient with EBA reflected the disease activity [22–24]. Experimental studies provided evidence that autoantibodies against type VII collagen are pathogenic. When rabbit and human antibodies were passively transferred into mice, they induced subepidermal blister formation and nail dystrophy [25, 26]. The active mouse model of EBA was also established by immunizing mice with the recombinant NC-1 domain of murine type VII collagen . However, it has recently been shown that the reactivity versus the NC-1 and NC-2 domains of type VII collagen protein is more predictive of an inflammatory rather than an autoimmune disease. This hypothesis is supported by the presence of anti-type VII collagen autoantibodies in inflammatory diseases involving the intestine, where the presence of this protein has been demonstrated but not featured by skin blistering such as Crohn’s disease and inflammatory bowel disease. However, the correlation between the presence of those antibodies and their pathogenic significance in that illness remains elusive [33, 34]. It has recently been reported that the major determinant of autoantibody pathogenicity relies on the different IgG subclass, and within the anti-type VII collagen autoantibodies the IgG4 sub-class was the most represented. IgG4 may induce inflammation and tissue damage by activating leukocytes with a non-complement fixing pattern or just binding collagen VII in a Fc-independent fashion leading to dermal-epidermal separation . Although in our study we have not identified the subclass of IgG-autoantibodies, we observed very high levels of IgG4 among patients with RDEB; this observation might explain the dissimilar clinical evolution not only relative to skin manifestation, but also in relation to extracutaneous complication, such as organ damage. Our opinion is that the most significant finding can be seen in the correlation between antibodies titres and the skin disease activity score. However, we also think that this finding should be confirmed on a wider number of DEB patients, considering the natural history of the disease. These correlations can also be assessed by means of other clinical scores [37–39]. On the other hand, the determination of anti-skin autoantibodies by means of the ELISA method has many advantages: it can be easily introduced in the clinical routine, it is little traumatic for the patient, therefore repeatable, and quantitative.